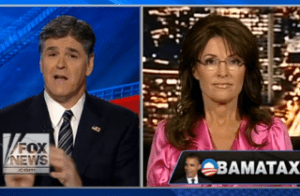 Blithering grifter and pretend human being, Sarah Palin, apparently still hasn’t figured out what irony means yet. The syntax and history mangling spewer of pure and utter nonsense appeared on the one place where nonsensical fallacies and partisan hackery come with a gold star: Hannity. Just a day after the Supreme Court decided in favor of the Affordable Care Act , the snow queen of death panels and tea party rabble-rousing is justifiably upset. After all, that the Supreme Court decided in favor of Obamacare means Palin can on longer make millions spreading smear and fear to like-minded morons. Well, at least when it comes to health care. Wow, and just when you thought Mitt Romney renouncing and discrediting his very own health care invention was the apex of irony. Firstly, Sarah “Spongebrain Squarehead” Palin must be referring to the Democrats she made up in her head since she has no Democratic friends. Secondly, the passing of health care has surely caused much ambivalence among Americans. Further, it can be said that some Democrats to remain skittish and uncertain, including politically vulnerable Montana Sen. Jon Tester and North Dakota’s Heidi Heitkamp, but ‘embarrassed’ and ‘disgusted’ are hardly words any person with real knowledge of the reaction would venture to use. If the lead-up to the passing of HCR lead to a million moron army of denizens of Wal-Mart on Rascal scooters, then one can surely expect the legal upholding of the HCR to cause even more deranged and horribly uninformed outrage. It would behoove us all to take a deep breath and focus on fixing the still crummy economic and the results of it being a 100 degrees all across the nation. Michael Hayne is a comedian/VO artist/Columnist extraordinaire, who co-wrote an award-nominated comedy, produces a chapter of Laughing Liberally, wrote for NY Times Laugh Lines, guest-blogged for Joe Biden, and writes a column for MSNBC.com affiliated Cagle Media. Follow him on Twitter and Facebook, Youtube, like and NJ Laughing Liberally Lab. Seriously, follow him or he’ll send you a photo of Rush Limbaugh bending over in a thong. This entry was posted on July 2nd 2012 at 4:25pm/16:25 and is filed under Live News Column 1, Politics. You can follow any responses to this entry through the RSS 2.0 feed.